Previous episodes in this series examined Big Flame’s overall approach to workplace interventions and the specific sectors of the motor industry (see Episode Episode 3) and education (see Episode 13). This one focuses on the Health sector. The period of Big Flame’s life (1970-84) saw many dramatic developments in the health sector in Britain. 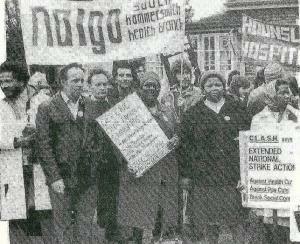 1973-74: Waves of militancy around pay, first by ancillary workers, then nurses. 1974: Reorganisation of the health service to promote centralisation and the philosophy of corporate management. 1977 onwards: New system of resource allocation used to produce cuts. Hospital closures; bed closures; increased workloads for NHS staff. 1982-83: Another reorganisation, this time to decentralise responsibility. Rise of general management. Domestic, catering and laundry service in hospitals put out to tender. There was an expansion of private practice within NHS hospitals. In the early to middle 1980s a substantial number of Big Flame members were active in health care struggles. By the late 1970s this had reduced to only a few. Some of these had a major impact within the sector. 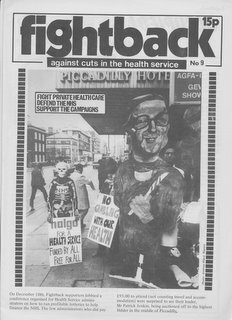 One BF member was involved in the occupation of Hounslow hospital in west London when it was scheduled for closure in 1977, and the launch of Fightback, a national campaign against health cuts in 1978. Big Flame saw health and not just a workplace issue. It believed that as every aspect of our lives is distorted by capitalism, we need all need to take an interest in issues of health care and the prevention of illness. The first is an article from Big Flame Journal no2 Winter 1975-76: Hospitals: our health is not for sale. This sets out to examine the reasons why hospital workers had become more militant, with many quotes from such workers. Events of the spring 1973 are mentioned in detail. The article sees the crisis in the NHS as part of a general crisis, and maintains the workers and patients should not have to pay for it. The second is a document form the 1976 conference: London Hospitals Report. The work of a BF base group at a London hospital is described. Events at the hospital are placed in the context of the restructuring of capital and developments at the level of the Area Health Authority. There is a discussion of why the base group was formed. The process of how it changed from a group of external militants to one person working inside the hospital is mentioned, but not explained. The report concludes with proposals of actions Big Flame could undertake in relation to hospital struggles. 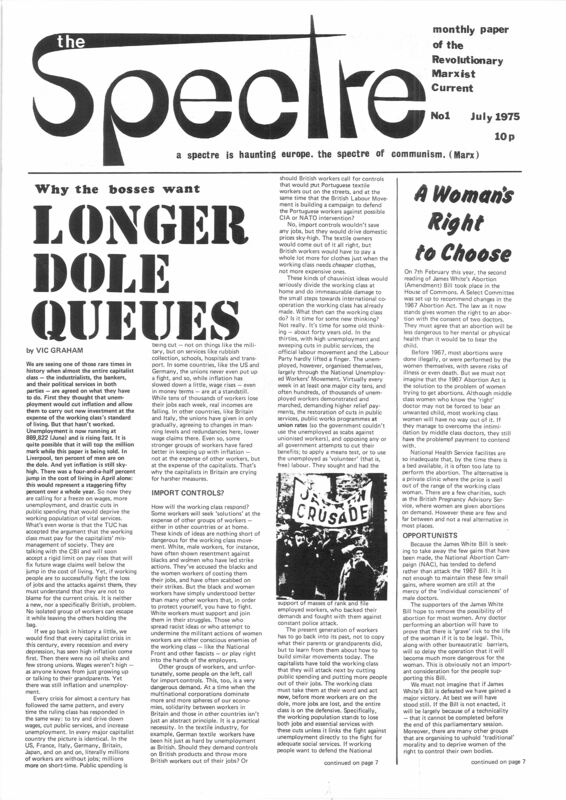 Finally, some linked articles form Revolutionary Socialism no4 Winter 1979-80: Health. The overall theme is alternative forms of health care. The “Introduction” highlights themes from the two articles, and argued for the need to combine fighting against the cuts with the struggle for a different kind of health service. “Popular Health” consists of an interview with a doctor and a community health worker from a health group in South East London. They talk about the things they have been able to achieve, and the potential impact of threatened cuts. “Health Care in China” is an assessment based on a visit to China in 1978. It describes what was in many ways a different approach from that adopted in the west, and concludes that whilst things were far from perfect, there had been a lot of progress. Episode 5 and Episode 11 of this series covered key debates at Big Flame conferences between 1975 and 1978. This post takes the story forward from 1979 to 1980. In Episode 11 I wrote that a simplified version of the history of Big Flame “can be seen as an ongoing debate with members pulling in two directions – those striving to uphold Big Flame’s traditional political positions and those who felt these needed some form of revision”. Unfortunately, it is difficult to come up with simple and accurate labels for the currents. The first one (who I will here call the “defenders”) was much less active at Big Flame Conferences during this period, compared to the previous one or the one which followed. The second (the “revisers”) did aim to make an major impact at Conferences during these years. 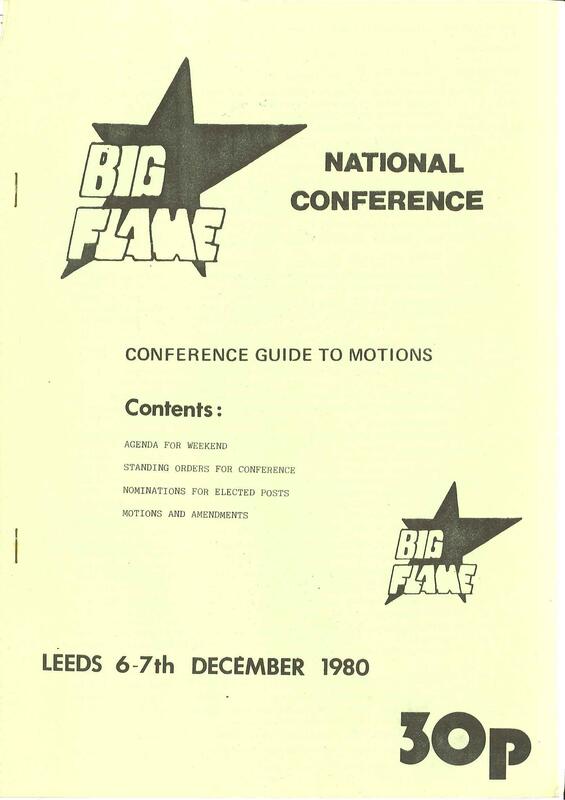 The November 1979 Conference was unique in the history of Big Flame in that the only general perspectives motion came from the National Committee (NC) as a whole, rather than one or more of the different currents. Here is the motion: Motion on Perspectives and Priorities. It argued that strategic goal was to break the cycle of Tory and Labour governments pursuing anti-working class policies. “We must resist the drift on the Left to channelling struggles through the Labour Party and placing demands on them and the Labour Left which reinforce illusions”. The goal is to build the socialist opposition in the working class. Although BF was small, it has a key political role to play. Also on the Conference agenda was a document from some of the “revisers”. Here is the document: Theses on Reformism. This defined reformism as those who didn’t base themselves on class struggle or seek to destroy the capitalist state, and includes the parties of the old Third International which had adopted Euro-Communism. Various approaches to reformism are examined such as the orthodox Trotskyist one, with the poles of entryism and exposure. They are criticised for failing to see reformism as a “multi-levelled phenomenon” which “reproduces itself in everyday life”. The authors argue that a perspective on reformism is necessary to “aid our political work”. The Theses were not voted on. A procedural motion was passed welcoming them as a “useful contribution” and calling on the NC to organise a detailed discussion. The “revisers” were unhappy with the outcome of the conference, principally because of what they saw as a kicking into the long grass of the “Theses on Reformism”, and the passing of a motion on “Socialist Alternatives”. This gave a very qualified welcome to alternative plans such as that of the Lucas Aerospace Combine Committee. It stated that there were ”no socialist alternatives to running capitalism” and “nothing inherently anti-capitalist” about alternative plans. Although, according to the motion, they could be supported if they helped fight closures and provided propaganda for socialism. Tendencies in BF were formalised for the first time in the constitution passed at the 1978 conference. The idea of setting one up had first been floated with the publication of the documents “Has Big Flame got a Future?” in October 1978 and “Seizing the Power” in January 1979. It wasn’t pursued. Now in March 1980 an Appeal to establish a tendency was published, followed by a Statement, taking the name Tendency One, in the Discussion Bulletin of July 1980. In the Appeal a tendency was described as a group of people within an organisation with common positions on specific aspects of an organisation’s politics, and work openly to develop it further. Here is the Statement: Statement of the Political Basis for the Formation of a Tendency In Big Flame. The political basis of the tendency is defined in terms of three points: (a) transitional politics (linking short term demands to the long term struggle for socialism); (b) revolutionary strategy on reformism (including favouring a Left Labour government as aiding the development of class struggle) and (c) central role of revolutionary organisation (against any moves towards federalism and for rebuilding BF’s interventionist capacity). The launching of the Tendency produced a hostile response from some in BF, in part because they felt that the creation of such a grouping was against the BF tradition. The Big Flame Conference of December 1980 saw a debate between Tendency One, and a position argued by members of one local group North London, which does not fall neatly into the “revisers”/”defenders” dichotomy. Here is the Tendency One document: Towards a Transitional Strategy: Prospects for Class Struggle. This includes a good analysis of Thatcherism (coming in only the second year of the Thatcher government), whilst continuing the arguments included in the Statement. It maintains that it is in favour of socialist alternatives, not in abstract, but as revolutionary interventions in class struggle. The Statement argues that the relationship between local struggles and the state at national and local level cannot be bypassed. Here is an alternative position signed by some members of the North London group: A Contribution towards a General Direction for Big Flame. As subsequent events demonstrated, the signatories probably covered a range of different positions, rather than a fully united one. The document talks of a “reassessment” of BF’s politics, but the document is better described as a consolidation of the past. It aims to emphasise some positions formally supported, but not taken seriously enough in the past. The document describes itself as a limited “ungrand” conception of political strategy and seeks an integration of socialism and feminism. It sees much of the talk of socialist alternatives as putting a lot of different ideas in one bag, and advocates them as a form of organising rather than abstract programmic exercises. One of the signatories of the North London position wrote a document of his own in response to those of the Tendency: Comments on the Tendency Motions and Documents. The Tendency are criticised for the language used to dismiss previous BF positions as “stale, unimaginative … negative … conservative”, and for adding feminism on to the end of motions rather than integrating it within them. Its discussion of socialist alternatives is said to remain abstract, rather than looking at specific plans. 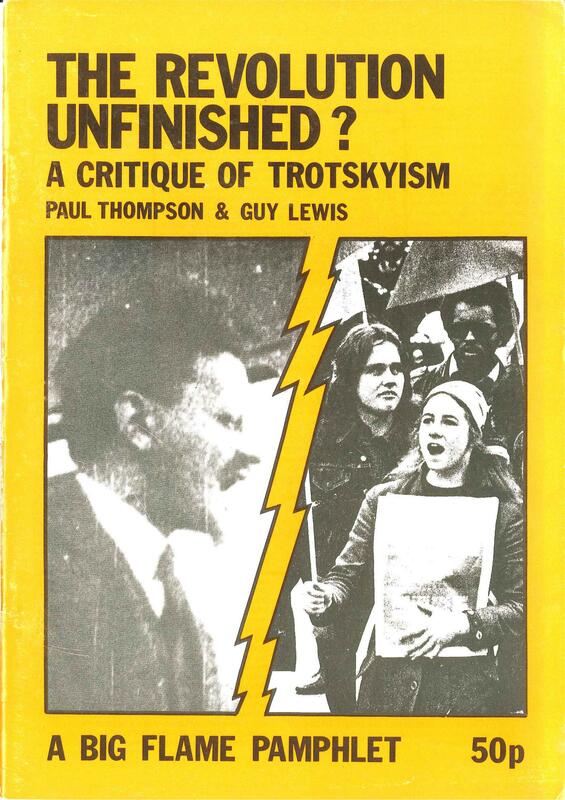 The approach to reformism is felt to be too close to the Trotskyist one, with the insight that reformism is reproduced in everyday life never developed. Supporters of Tendency One and North London argued that their positions were incompatible, and that the Conference should vote for only one of them. This wasn’t accepted by those present and the motions from both were passed overwhelmingly. The two motions took are more sympathetic approach to alternative plans than the previous year’s one. Tendency One said: “we fight for counter planning from below and workers’ plans, the design and production of socially useful goods, and production for use value”. According to North London (as amended): “Big Flame will call for and support workers’ plans in workplaces where their development seem appropriate and useful. … We also recognise that workers’ plans, by themselves, cannot constitute a general strategy for workplace struggles, and the form and content of counter planning will vary according to the needs of the situation”. As mentioned above, the “defenders” current didn’t submit a general perspective document or motion in these years. In the Discussion Bulletin February 1981, one of the current’s supporters wrote about the 1980 Conference. He criticised both motions on the grounds they were vague, written in difficult language, and unclear what they meant in practical terms. This perspective was probably shared by others from this current. The Reformism and Transitional Politics discussions led on to another one about the Labour Party (see a future episode in this series – see Episode 27). For many former members the annual Summer Schools are one of the most fondly remembered aspects of being in Big Flame were . In “Coming Down to Earth”, an article in Revolutionary Socialism which was part of the “Daily Life” theme, the author wrote: “At our Summer Schools, when many of us live together for a week. It is remarkable how thoroughly we try and act on our ideals of open, supportive, and non-sexist relationships” (article available via a link in Episode 18). The Summer Schools were generally felt to be one of more successful examples of collective childcare (and probably something the present government has rendered illegal with the requirement for all those providing childcare to be registered). It should also be acknowledged that they resembled life in the real world with their share of bust ups. 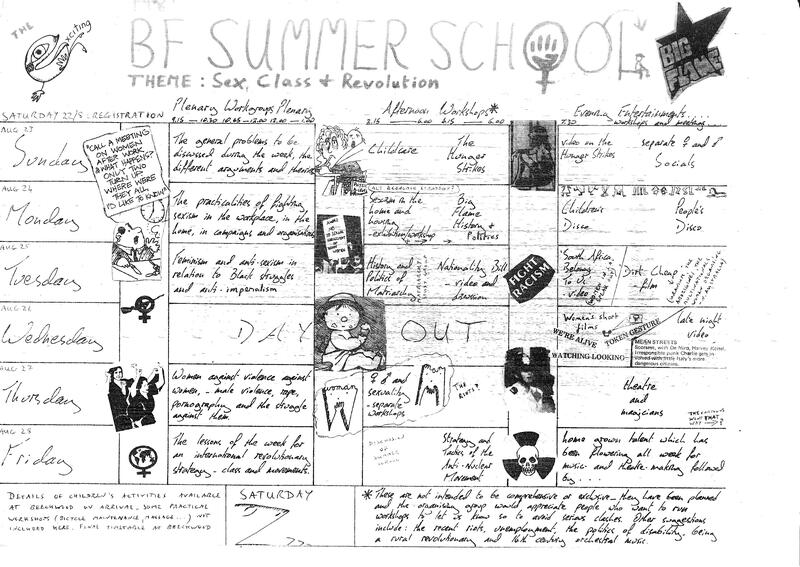 A very good introduction to the Big Flame Summer Schools can be found in an article in the February 1981 Discussion Bulletin: A Short History of Big Flame Summer Schools (Warts and All). – The first one was in 1977. Most lasted a week. The intention was to combine education with comradeship. The venue moved around, with Beechwood House near Leeds the most common one. – Some years had a theme for the educational sessions, other not. Sometimes “big name” speakers were invited. Other times they were “home grown”. There was a combination of large plenary sessions and small workshops. – Tasks were shared, the exact arrangements changing from year to year. The 1980 approach was to assign people into groups for the week, ensuring a balance of gender and their local group. Each day they had a task: crèche, cleaning, washing up, bar tendering, and baby sitting. The groups also provide the basis of educational workshop discussions, and a support group, especially for people new to Big Flame. – Entertainment, apart from the bar, included films, sing songs and sometimes an outing away from the venue. – Controversial flash points included the choice of films. “Themroc” and “Morgan: A Suitable Case for Treatment” were strongly criticised for sexism, with walkouts. There was never agreement on the plenary/workshop split, with some unhappy with having the former, and others feeling speakers went on too long. Big Flame on Sea: Paper September 1978. On Our Hols: Paper September 1979. Summer Support: Paper November 1979 (letter). “Its Magic” with Big Eric: Paper September 1980. A Sado-Masochist Bonanza? : Paper October 1981. A Working Class Woman’s View: Paper November 1981. 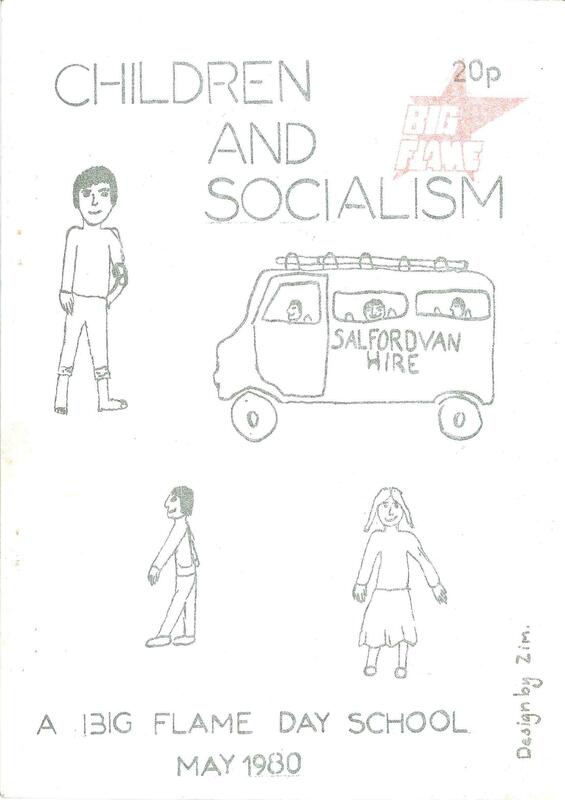 Children and Socialism: Discussion Bulletin May 1980 and Children and Socialism (1981). Draws on an experience of collective childcare involving 6 adults and 3 children in two homes. Talks about supporting members of BF with children, noting some improvements in childcare within the organisation. Also considers the issue of passing politics on to children – letting them learn how politics is part of everyday life, that socialist politics can be fun, and that children must be given a chance to define what they do. 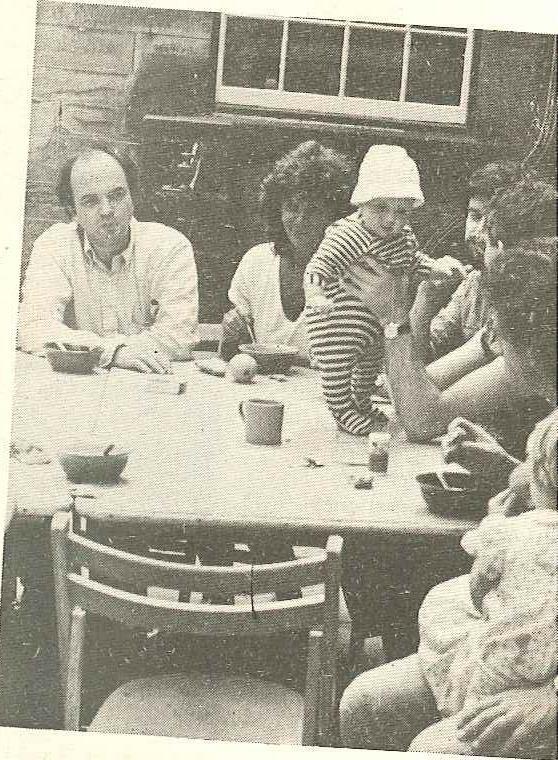 Socialism and Childcare: Discussion Bulletin May 1980 and Children and Socialism (1981). Discusses the pressures on isolated mothers with very young children, the factors crucial to the job of bringing up children, and the how the medical profession controls women (induced childbirth, breast feeding) and how schools exclude them from involvement with the children (in relation to the last two issues there may have been some improvements over the last 30 years). Other articles in the Bulletin were “Notes on Being a Red Teacher” (included in the post on Education see Episode 13), a guide to organising a crèche and one on Kinderhaus, a childcare facility in Hamburg. Children and Socialism: Opening Plenary Session: Children and Socialism (1981). Covers a range of issues such as the difficulties of bringing up children as socialists; non-parents and kids; state nurseries and the interaction between revolutionary politics and bringing up children (the lack of sympathy from many on the left to the problems, resentment from children with parents constantly out at meetings).